So how do you know which box to choose? You’re in luck! We’ve created an in-depth guide to any box you will ever need. So the next time you’re in need of a box to ship, store, mail, or gift – you’ll be ready. Corrugated boxes are your everyday shipping boxes. Sturdy corrugated cardboard allows your boxes to withstand the jostle of the commute. This ensures your items will remain intact. 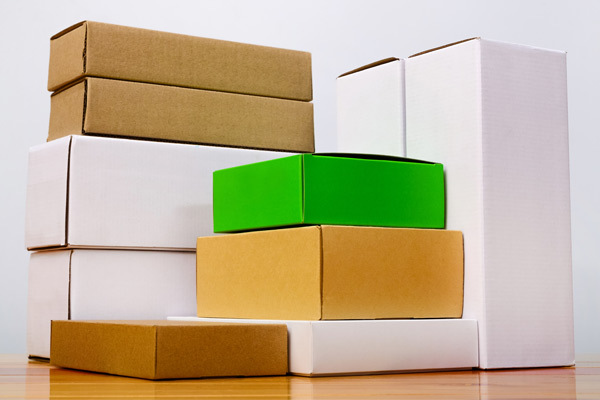 Standard corrugated boxes are available in a variety of sizes and dimensions, with especially heavy duty cardboard for your most fragile items. Nothing ruins a birthday party more quickly than a cake that didn’t hold up in transit. To keep baked goods looking delicious, we offer a variety of bakery boxes featuring reinforced bottoms, as well as boxes with fitted inserts designed to keep cupcakes and other treats safe and secure. 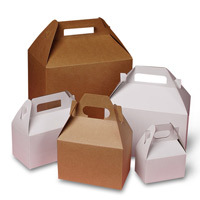 Tuck top and tab lock mailing boxes are made of strong corrugated cardboard. The tucked sides and tab locks provide an extra level of security. This ensures that your box stays closed tightly during shipping. These boxes are great options for e-commerce retailers since they come in a variety of sizes suited for any shipping need. Bonus Tuck Top / Tab-Lock Feature: The classic white exterior stands out from your typical brown box. It can also be easily customized with business labels or logos. Like our corrugated tuck top and tab lock boxes, our matte-colored mailing boxes are strong enough to withstand cross-country mailing — and look good doing it! These easy-to-assemble boxes come in a variety of shapes and colors, making them a perfect packaging option for small businesses or gifters who want their packages to make a statement as soon as they land on the recipient’s doorstep. Kraft covered setup mailing boxes arrive already assembled, with added finger holds for easier lid-lifting. 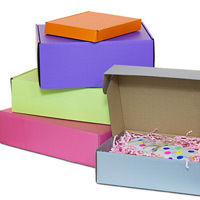 Available in a variety of sizes, these are the perfect boxes for wrapped birthday presents or holiday gifts. Mailing tubes and boxes are the best way to safely send any document or print, from hard-earned diplomas and certificates to dorm room posters. When you ship, mail, or store your documents using mailing tubes or mailing boxes, your documents should arrive without any tears or wrinkles. Once the package arrives, all you have to do is unroll! Jewelry boxes keep your valuables safe, whether you’re packing them into storage or gifting them to a loved one. We’re happy to offer a variety of styles to keep your baubles looking their best and brightest, from traditional lined boxes to velvet ring cases. Gable boxes are made from a single flat piece of paper or plastic that folds into a conveniently sized box with a handle on top. Available in hundreds of different colors, patterns, and themes, this is the perfect box for gifting holiday treats. Favor boxes are a stylish and convenient way to thank your party guests for attending that special event by sending them home with a little token of your gratitude. Available in a variety of sizes, patterns, textures, and finishes, favor boxes are ideal for chocolates, toys, specialty soaps, and anything else you’d like to gift to your guests. Apparel boxes are easy-to-store, flat boxes that are ideally suited for packaging or storing clothing items. Whether you’re a retailer fulfilling online orders or you’re sending clothing items as gifts during the holidays, apparel boxes will protect your items so they arrive neatly folded and unwrinkled to the intended recipient. These boxes aren’t just for Chinese takeout. Decorative wire handle boxes come in a variety of sizes and colors, from clear plastic to metallic or embossed. Get creative and use them to store party favors, ship small gifts, or as fun home organizers. Tab top tote boxes and tent bags offer the strength and support of a box with the style of a bag. 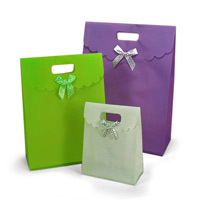 Paper Mart offers tab top tote boxes in a variety of styles and colors, from embossed wine boxes to plastic tote bags perfect for candies and small treats. Custom printed boxes are ideal for small businesses looking to brand their packaging and make an impression on customers — before they even unbox their purchase. Printed retail boxes are a great packaging option for online retailers, brick-and-mortar stores, or weekend craft show vendors. By sending your customers home with a stylish box adorned with your logo, you’ll ensure that your brand is top of mind when it comes time to make similar purchases in the future. When it comes to buying boxes, you want to be sure you have the right size and design for any item you’re packing up. Paper Mart has a box to suit your every need, and with our lowest price guarantee, you don’t have to break the bank the next time you ship out a batch of orders. One of the best article about retail boxes for small business owners. Thanks for sharing this info.